Papilio is known far and wide in the fashion world for its beautiful and unique styles, as well as for its superb quality and craftsmanship. Papilio Fashion House most certainly lives up to that reputation with all fashion collections of evening dresses and cocktail gowns. The gorgeous designs in Hellas Collection are the exclusive creations of our chief designer – Alena Goretskaya who has modeled these evening gowns with a particular type of woman in mind. Alena says that she had a picture of a classy lady who is confident and happy; she is that intelligent woman who has a natural panache and can easily pull an elegant outfit together. This woman does not spend her time worrying about whether or not she is wearing the very latest looks. This woman is not worried about the newest trends, nor is seeking anyone else’s approval or attention. She wears what she likes, and she does so with poise. She is secure in who she is, and both her style and her attitude makes that clear to everyone she encounters. With that in mind, the atelier designed the most stunning and beautiful line of cocktail and evening dresses, and Papilio is proud to share Hellas Collection with you. The dresses in this line are not only classically beautiful, but they are also thoroughly modern. Their timeless grace will never go out of style. This collection is perfect not only if you are looking for an evening dress, but also if you are searching for bridesmaid dresses or maid of honor dress. These romantic and elegant designs will be perfect for your wedding party. Your family and friends will thank you for not adding another bridesmaid dress to their closet that they will never wear again! Classically elegant, your bridesmaids or maid of honor will find themselves looking for occasions to wear their dress again and again after the wedding is over. Besides, your wedding party will be the picture of sophistication and class as they walk down the aisle in one of Papilio beautiful designs. With a large variety of styles and lengths, there is the perfect dress for every bride’s vision. The evening dresses from Hellas Collection range from quietly sophisticated to sultry and alluring to sweet and feminine. All of them, however, share the common thread of timeless elegance. 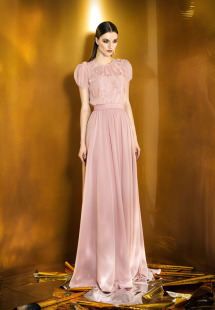 Whether you are looking for that perfect gown to wear to a special occasion, bridesmaid or maid of honor dresses, this collection has your look. Please note that all dresses are available by special order only, contact us for details at (647) 748-1908 or via email: info@papilioboutique.ca.